I like giving wine as a present, because it tastes good, and it's special. But sometimes you need to make it a little more special, or at least... more silly. Enter wine cozies. These wine dresses are wonderful kitsch. They dress up a bottle of wine, which, you know, doesn't actually need clothing. They are attractive and hideous at the same time. Swoon. 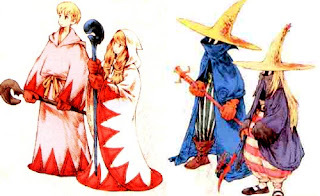 I know, technically white and red would make more sense, as these are the colors of wine, but the black mage outfit is so much cuter than the red mage outfit. Here's what I did. 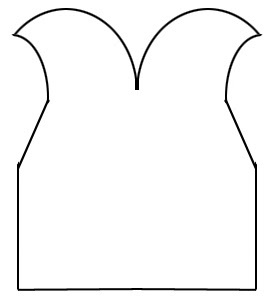 Cut a piece of the satin and a piece of the lining in a flattened cape shape, like this. Make sure its scaled properly for a bottle of wine, this is just a rough sketch. With a machine, sew them together around the outside with white thread, with the outside of the fabric facing each other, leaving a small hole at the bottom. Flip it inside out and then sew the hole shut. Hand sew the top of the head of the cape together. Test it out on a bottle of wine and see how it looks. 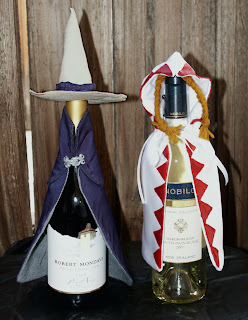 I'm sure this would look great if you hand made each triangle sewed them on the robe... but come on, this is just a wine dress. I recommend the little cheap bottles of acrylic craft paint at Michaels, or some Tulip fabric paint, and a small, square paint brush (cheap=OK). 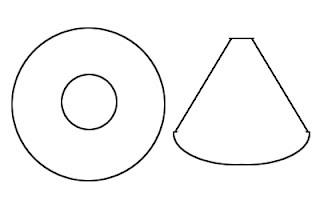 Mark out even intervals on the satin with a pencil, then just draw the triangles freehand. This is easy, we learned triangles in kindergarten. However, waiting for them to dry is hard. I wanted to tie her robe closed at the neck with some ribbon, and also give the neck a nice ruffle texture. About.com decribes how to make a ruffle here. After forming the ruffle, sew the ribbon around the neck and tie a pretty bow. After making sure the robe still fits loosely over a wine bottle, sew the bow in place so its perfect bowness doesn't get mussed in the future. Figure out how long you need the hair to be, then double that length and add an extra 1/3 for safety and knotting and braiding. Unravel a length of yarn from your skein that is 12x that length. Cut it in 6 equal pieces, line them up, and tie a tight single knot in the middle. You should now have 6 pieces of equal length hanging off each side of the knot. Braid them. Tie off the ends. Sew the top knot into the top of the hood of the cape. You can buy a nice fastener something like this at Joann Fabrics and skip this step, but if you are a Sculpy luver like me and already have some on hand, this is fun. Roll out two chunks of silver Sculpy into two thin strands. Roll them together so they look like a nice spiral. Cut this in half. Shape the spiral strands into a hook and eye, with loops for the thread to go through. Make sure they fit together. Bake in oven according to directions. 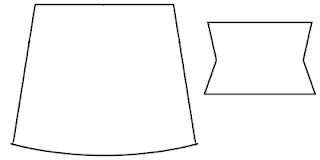 Cut a piece of the silky fabric and a piece of the stiff fabric into these shapes. 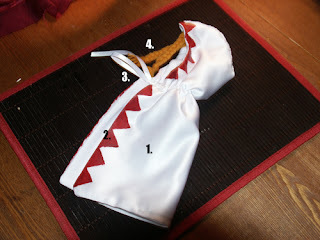 As with the white mage robe, sew together around the outside, leaving a small hole. Then outside of the fabric facing in, then flip outside out and finish the hole. 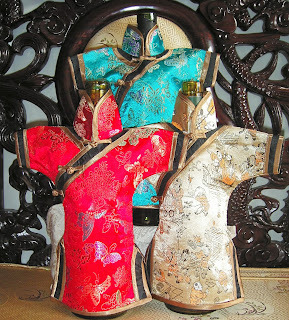 Sew the two pieces together with a few well placed stitches, then sew the fastener on at the neck. I spent a lot of time looking for the perfect fabric to approximate straw - because I didn't want to really weave a straw wizard's hat. I found needlepoint fabric, which has a big weave look and a nice rough texture. I really hacked this out, there is a probably a better way but I was getting tired. 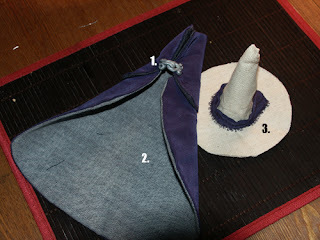 If you want to look at a commercial witch hat and see how it is sewed together, that might work better. This is what I did. Cut the tan base fabric and the needlepoint fabric so they look something like this. With a sewing machine, sew the top part of the base fabric to the brim. Then sew the seam of the top part together. Its OK if this looks totally crappy as long as it's the right basic shape. Now, hot glue the needlepoint pieces to the base shape. There will be an ugly seam between the top part and the brim part. I covered this with a hat band made of the blue silky fabric from the robe. Now you're all done! Share these with a fellow g33k, or horde for yourself. Oh my god. XD These are awesome!